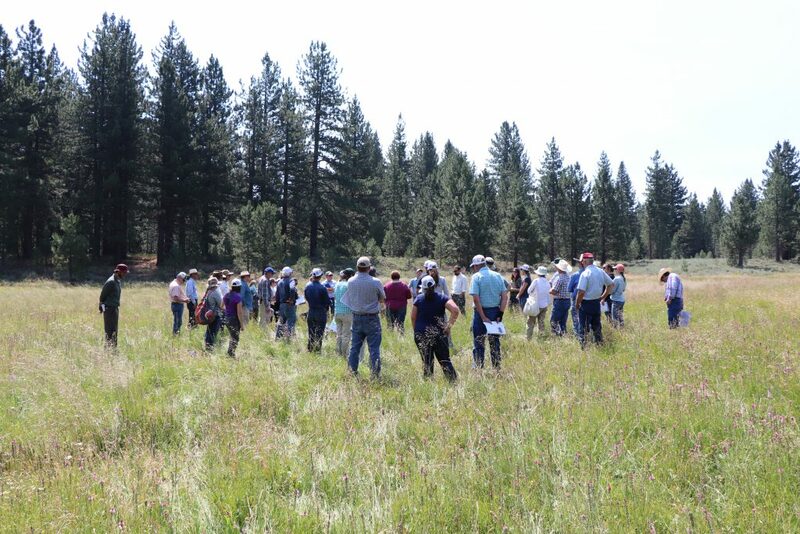 In late July, UCCE Plumas-Sierra and UC Rangelands hosted the 2nd Rustici Rangeland Tour on the Beckwourth Ranger District for more than 60 attendees on the Plumas National Forest. The event created a venue for local forest staff, agency leadership, grazing permittees, and other regional stakeholders to discuss contemporary research, management, and monitoring for sustainable public lands grazing. The Rustici Rangeland Tour was established as part of the Rustici Rangeland Science Symposium series to bring hands-on extension education opportunities to local resource managers and stakeholders in a field-based setting. "The Rustici Tour provided an overview of UC research occurring on the local forest and insight into policies changes with the potential to impact grazing allotment management in the future" stated Plumas Forest Permittee Rick Roberti, Beckwourth, Calif. "Most importantly, it provided a venue to open up the doors for new collaboration between permittee and local forest service staff with the help of UC Cooperative Extension." The 2018 Rustici Rangeland Tour was supported by an extension grant from the UC Davis College of Agricultural and Environmental Science’s Russell L. Rustici Rangeland and Cattle Endowment; and support from UC Rangelands and County of Plumas and Sierra. For more information and tour handouts, click here.